Today’s installment of the Soumak Pouch Weave Along is a video tutorial about warping the looms for the ‘no warp ends’ technique that will be the foundation of the Soumak Pouches. There are a number of hints and tips that I have found that make warping for the pouches much quicker and easier. The video shows how to warp the 8 inch and 12 inch Mirrix looms, using ‘s’ hooks. 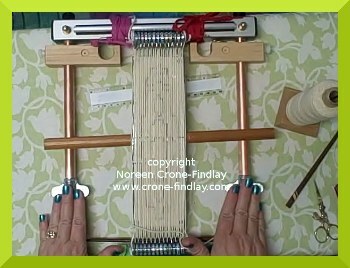 The Mini (5 inch loom) is warped using the ‘no warp ends’ kit from Mirrix. The looms are almost gift wrapped after warping! I have found that using ribbons to tie around the ‘s’ hooks on the lower edge of the 8 inch, 12 inch or larger Mirrix looms keeps the weft yarn from getting snagged on the hooks while weaving. And, the Mini wears little babushkas or headscarves! Yep. I tie bias tape or ribbon around the ends to cover the paper clips and keep them from snagging on clothing and to protect them. I know it may seem odd, but it makes the weaving go more smoothly. Your descriptions are so clear and easy to understand. What a fine teacher you are. I wanted to give as many options as possible for the pouches, which is why I showed several variations. In the video, you will see that the 8 inch Mirrix is warped in the usual way.. although, you can warp it like the Mini, but you will have a longer pouch, which is just fine. If you are weaving this as a cellphone pouch and have a larger cellphone, you may prefer to warp the pouch longer and wider to accommodate the bigger phone. I showed doubling the warp as an option for people who prefer to work with a thicker warp OR for people who have only got very thin warp OR if someone wants to work with very fine weft, so they would prefer to work with 16 epi instead of 8 epi.